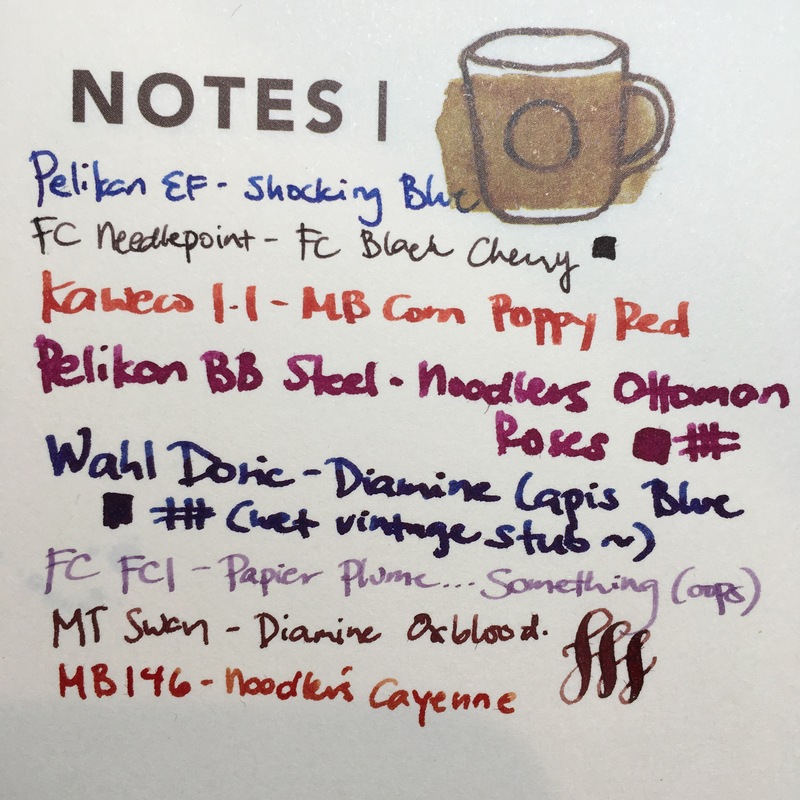 I don’t think I’ve written about how I got sucked into the rabbit hole that is the fountain pen Instagram community… long story short, it was via the fantastic stationary goodies Target sells in the “dollar spot”, now called the bullseye playground. 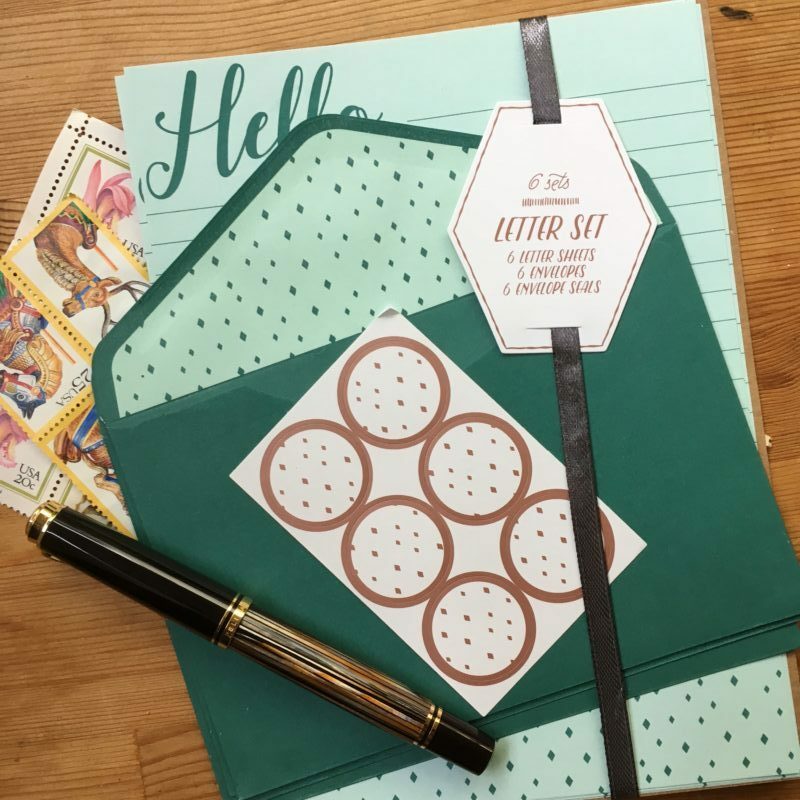 I’ve been buying cards, post its and other paper goodies from them for a couple years now, and have found them to generally be fountain pen tolerable — so when I picked up this stationery set earlier today, I thought I’d do a quick review! First things first — it’s $1 (+sales tax) for a matching set of six envelopes, six sheets of paper and six sticker seals. The paper is a light mint, but there is also a pink/magenta themed set in stores right now. The bullseye playground lines seem to rotate fairly often, so I thought I should get this review up sooner than later. 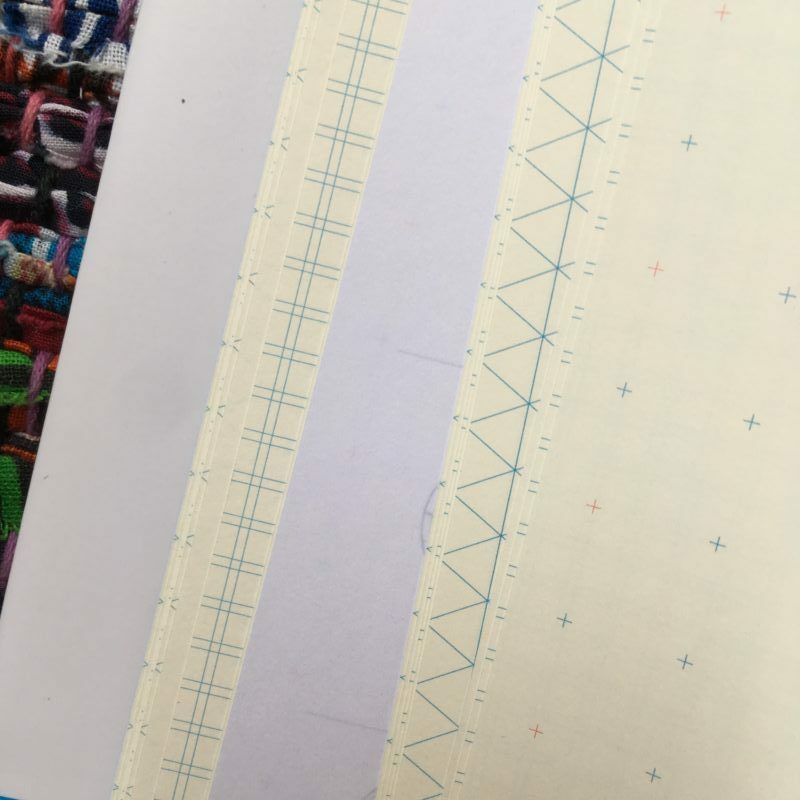 The stationary is manufactured by Madeforretail, who also seems to manufacture quite a few of their other paper products. There’s a close up of the different inks above. 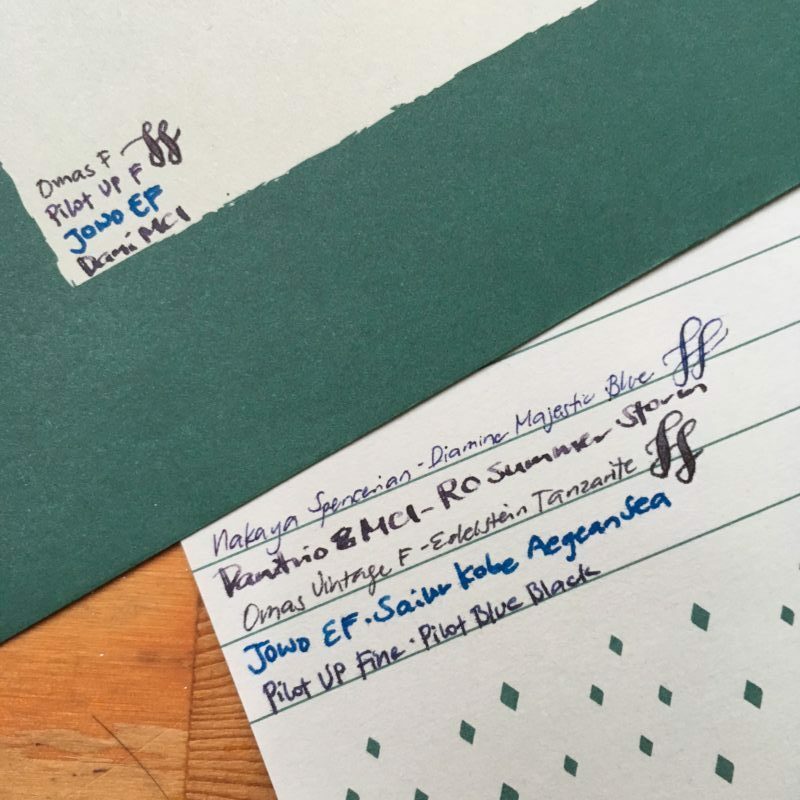 I’d say the paper is comfortably usable with Japanese fines, but for anything broader than that, there will be some feathering, but the amount varies from ink to ink. It’s a thick paper, with almost no show through. This is a close up of the page where the flex curls are. 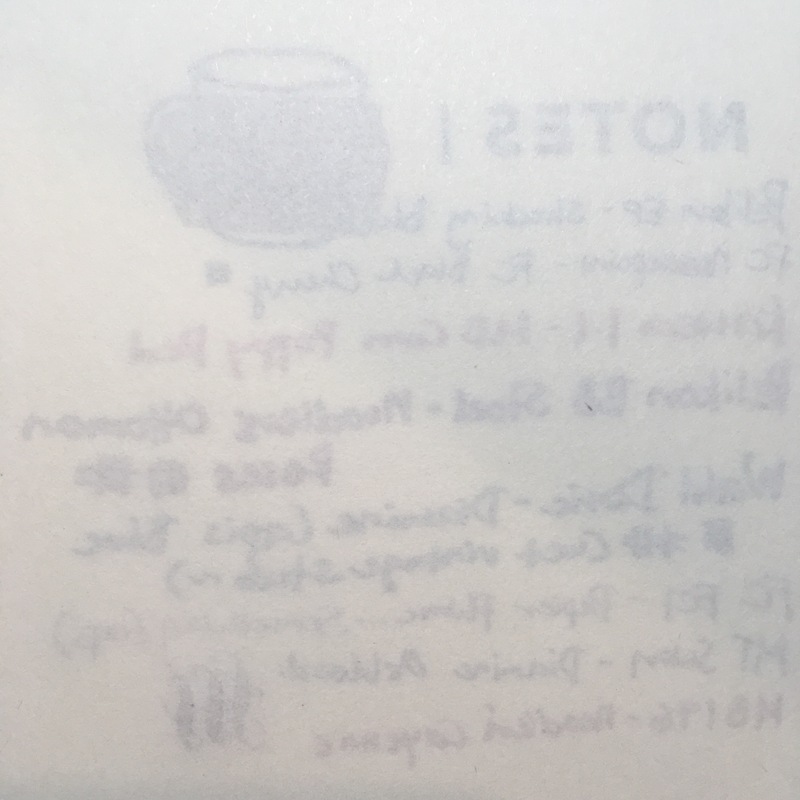 You can see the texture of the paper in this shot — decently smooth, but not coated, the way Rhodia is. I had no issues writing on it with a fine, or even a Spencerian grind nib, but I do have a light hand. 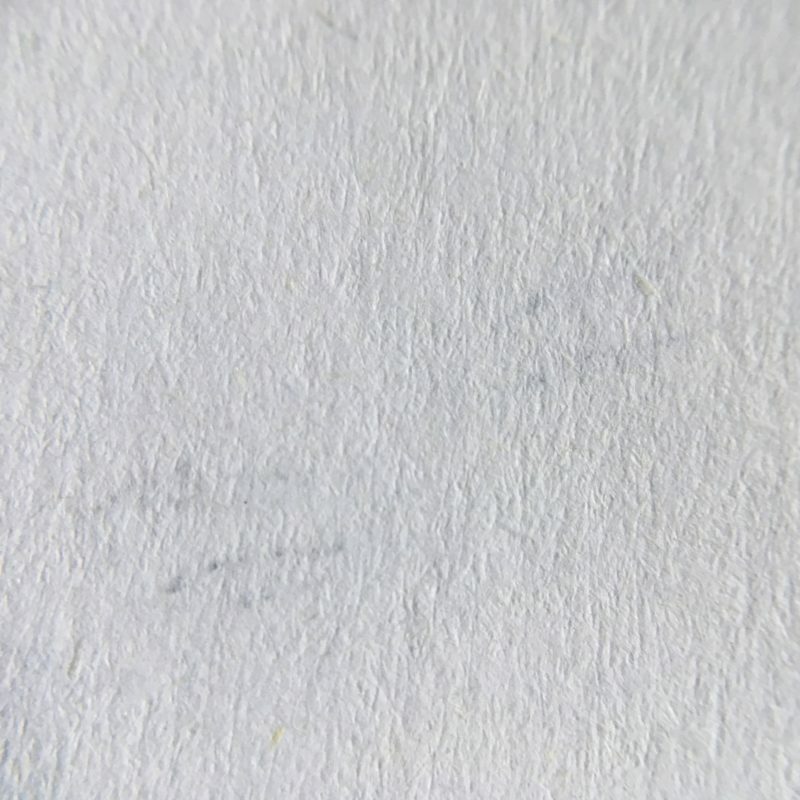 I’d say it’s very similar in texture to most copy paper. Here’s a writing sample on the envelope. Surprisingly, it’s a little better than the inside sheets! Overall, at a $1 per pack, I think it’s a good buy if you like the aesthetic and don’t plan to use a super broad or wet nib on it. I wrote a letter on it using my fine VP, which, if you squint at it, does have a little feathering, but is totally readable. My one complaint is that you have six envelopes and six inside sheets — that means each letter is only 1 page long? That’s pretty short! Alternately, I’ll have leftover envelopes, which, given the cute inside envelope liners, may not be a bad thing! 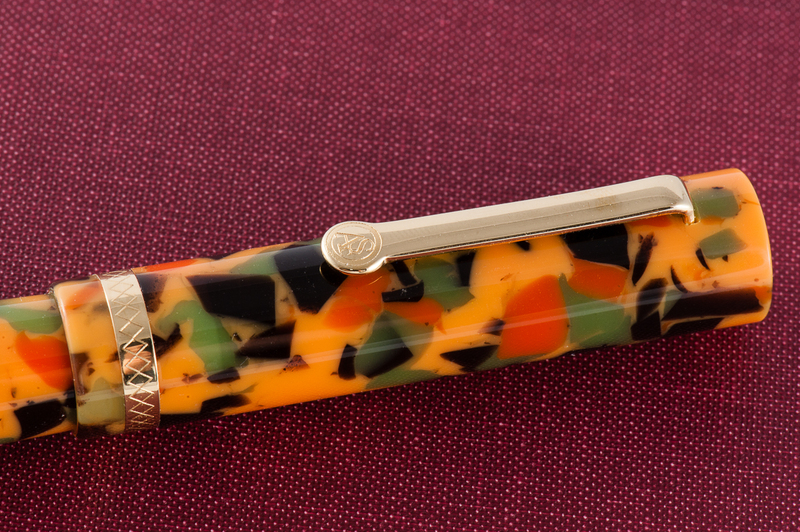 Once again, we’d like to thank Mr. Detlef Bittner of Bittner Pens for lending us this ASC Pens Arlecchino 2 fountain pen for review. His family pen store is located in the beautiful town of Carmel, California, and is well known in the pen shows in the United States. The opinions here are our own and we were not compensated (monetarily, or otherwise) for this review. Pam: The pen is a pretty and appealing shape. The material however is quite busy. For someone who really enjoys a lot of monochromatic pens, this is a bit of a shock to the system. 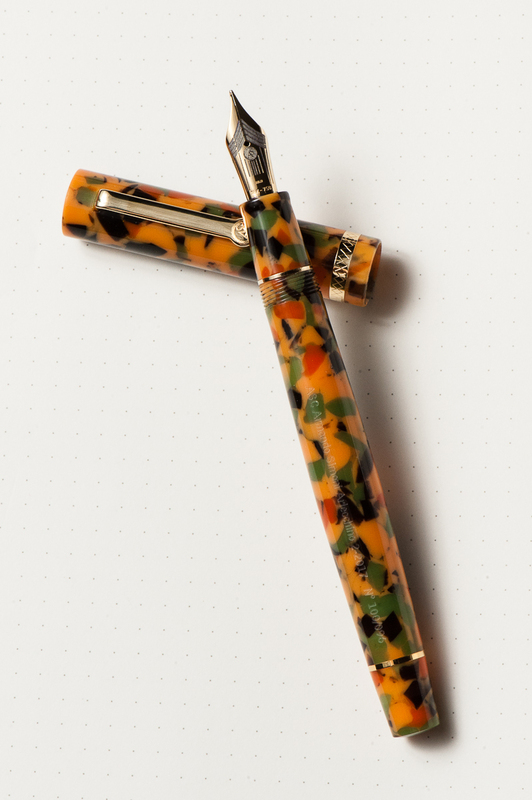 The material is unique, and unorthodox in a pen. In summary, the shape and silhouette of the pen is wonderful, but the material is an acquired taste. Katherine: I think the star of this pen is the Omas Arlecchino material. However, it’s just not my thing. It reminds me of pumpkin soup. Or the Filipino dessert commonly called “cathedral windows“. Or fall leaves that are turning. Anyway, reminds me a lot of things, mostly makes me hungry… but just isn’t my thing on a pen. Claire: I really fell hard for this pen in the short time I had to write with it. I was quite surprised since this isn’t the sort of pen I would normally even bother to try. The barrel is a lot longer than what I normally find comfortable. 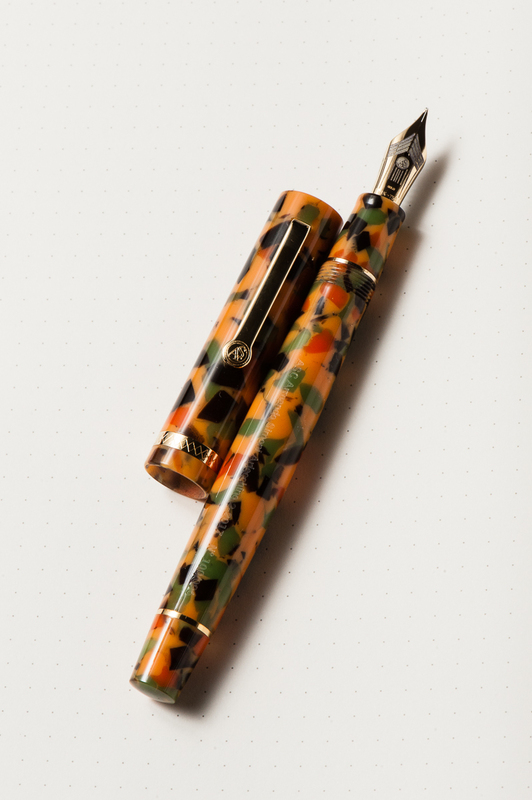 I do find the material to be a bit busy for my taste but other than that I like the shape of this pen. 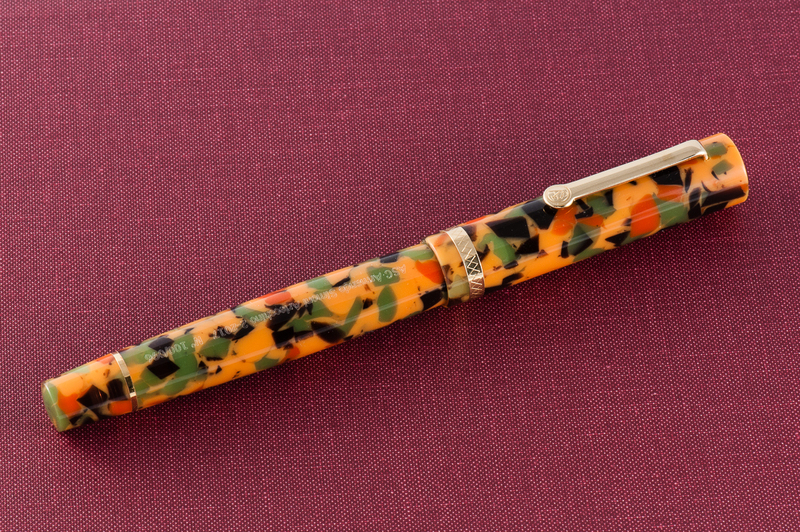 Franz: I first saw the ASC Arlecchino 2 pen at the 2017 LA Pen Show when a friend from the San Francisco Bay Pen Posse bought one and I was immediately intrigued with the unique finish of the pen. 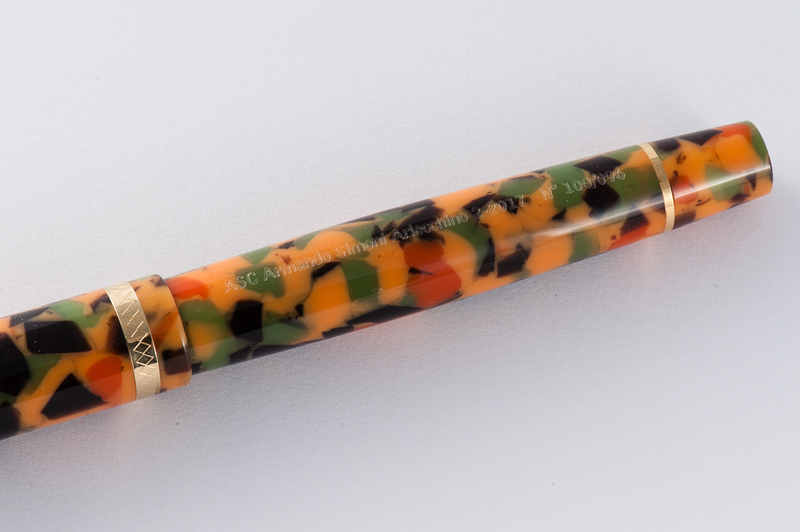 Actually, I’m loving the design of the pen and the celluloid material. 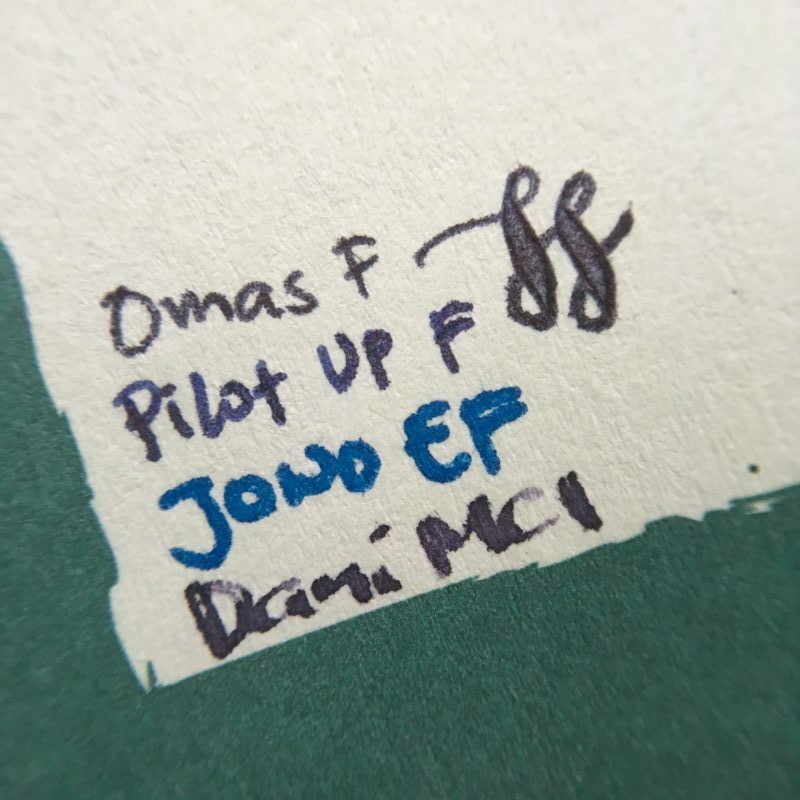 This material was part of the Omas stock bought by ASC Pens when the Omas Pen Company sadly shut down in 2016. 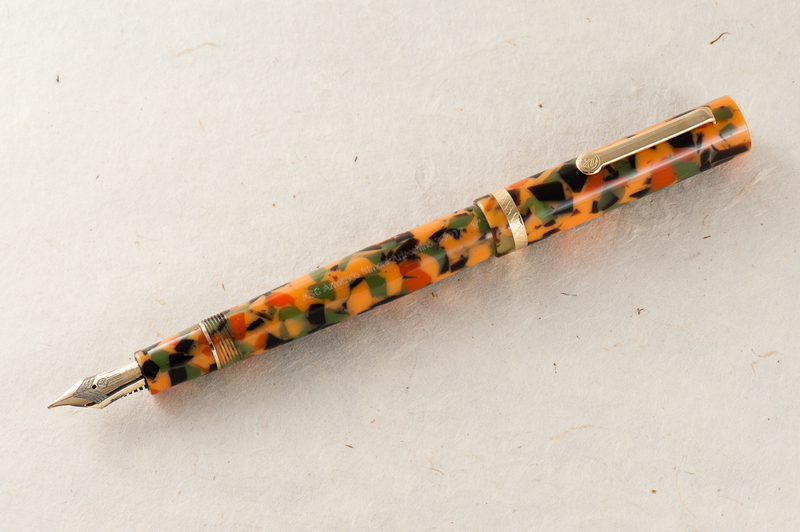 According to ASC pens, they acquired just enough of this rod stock to create a limited edition of 100 pens to pay homage to the original pen called, the Arlecchino (Italian for harlequin). Pam: The nib itself is a great writer and performs well, as expected. The nib was very enjoyable as a writing experience. I did find the nib to be springy in the perfect Goldilocks kind of way. 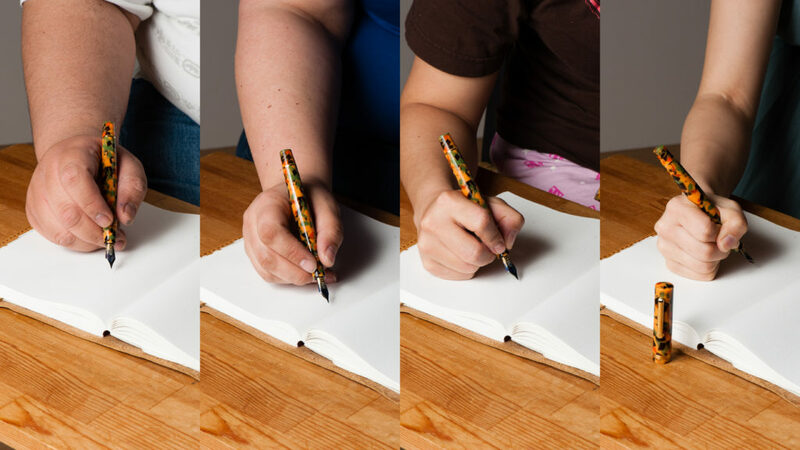 Claire: I loved the feel of the nib and the overall writing experience of the pen was pleasant. The nib has a bit of bounce without being so soft or mushy. 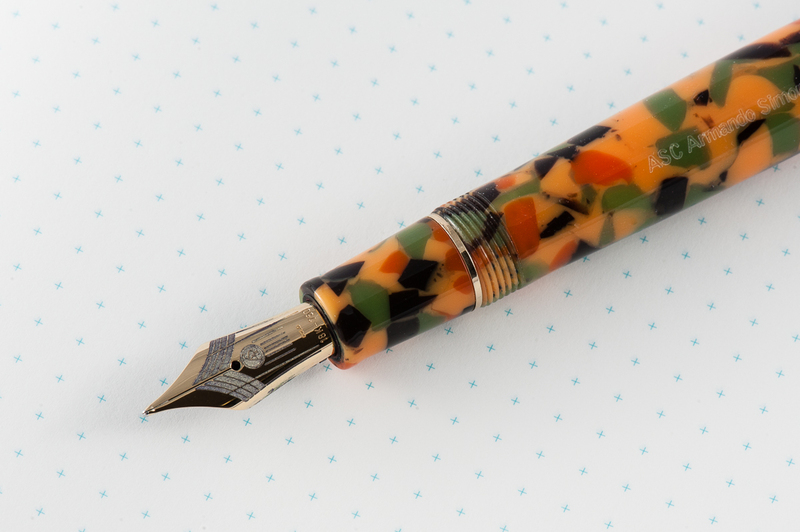 It’s not what I would reach for as a workhorse nib, but it’s great for a little extra pizzazz. Franz: The Magic Flex nib is such a smooth writer and is quite springy which gives my writing some flair! The black ebonite feed kept up with my writing even when I flexed it a little. 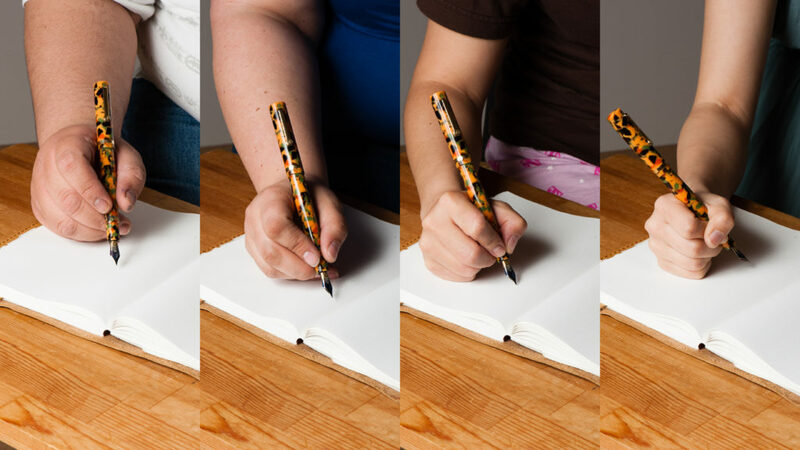 Pam: The shape and size of the pen lends to great comfort for extended writing. Honestly, maybe it was the nib, or the light weight of the pen, but the pen didn’t leave an impression for me. It was a comfortable, well balanced pen, but no more, no less for me. Katherine: This pen was pretty comfortable in the hand for a long period of time. The gentle taper of the body makes it a little more interesting than what I envision a “generic” pen to look like. This also (I think) makes it a better balanced pen. Claire: I had trouble putting this pen down when writing with this pen. I was more than a little disappointed when I had to let Pam, Katherine and Franz have a chance to give it a spin. 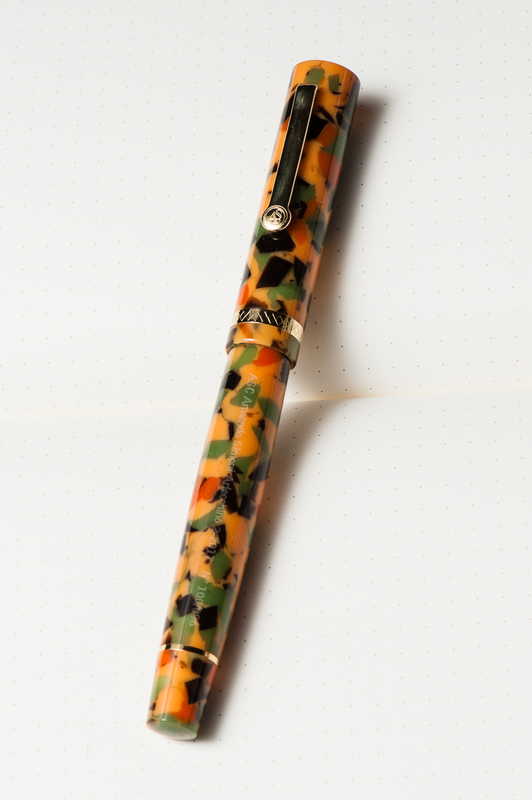 This pen is not like any of the pens in my collection and really was a lot of fun to write with. I had no trouble writing with this pen for pages on end. There was no trace of hand fatigue or pain even after a few pages. Franz: I really enjoyed writing with the Arlecchino 2 as it is light and well balanced when unposted. Writing with the cap posted made it a little too lengthy and I found it unbalanced. (Yes. Shocking, I know!) My only small wish is for the section/barrel to be just a hair thicker to be perfect for my bear paw. But that’s just me. 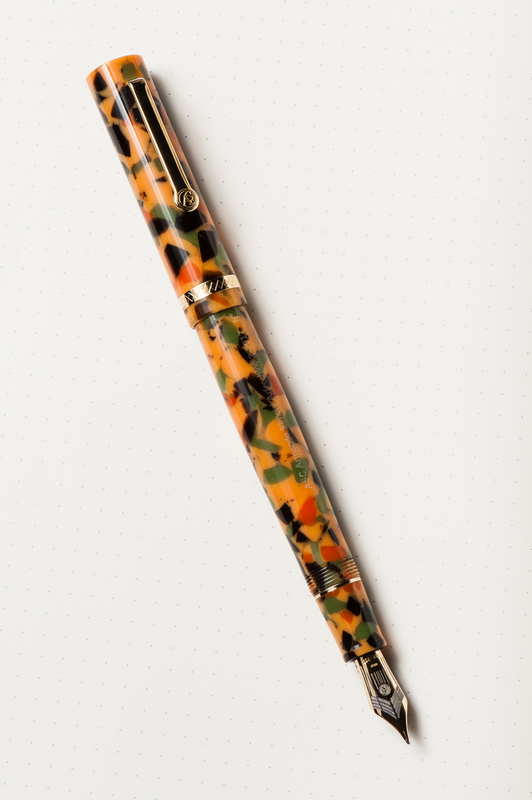 Pam: This pen would be quite a show stopper in any pocket or as a notebook companion with the colorful material and sweet nib. The clip seems sturdy enough to be kept in shirt pockets. 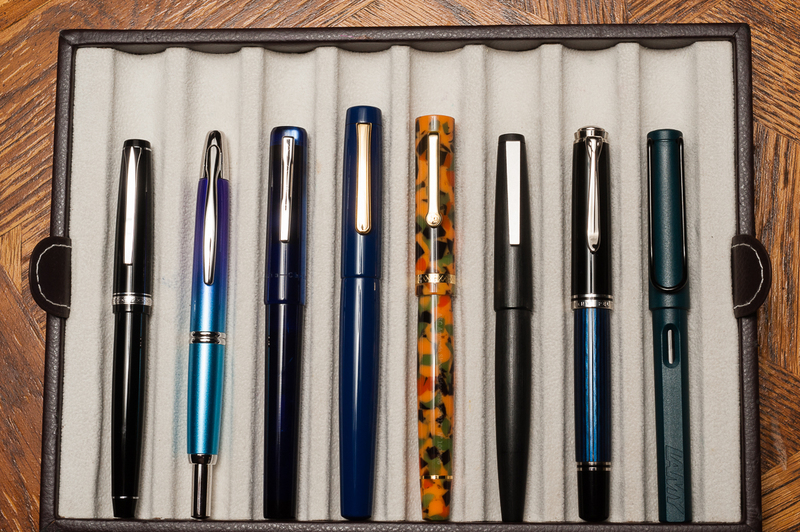 Katherine: This was another loan from Bittner Pens — so once again, no real EDC usage. But, it seemed well made, and could hold up to every day use. It’s a solid pen that is a comfortable size both to use and to tuck into a pocket or notebook. And the clip feels solid enough to keep it firmly attached to a shirt pocket, if I had shirt pockets. Claire: I didn’t have a chance to carry this pen with me for a few day, but I can see this being a daily writer in my arsenal. The diameter of the pen is just about perfect for long writing sessions which is ideal for me. Franz: I was not able to fill this pen with ink and use at my workplace so no real world EDC report. 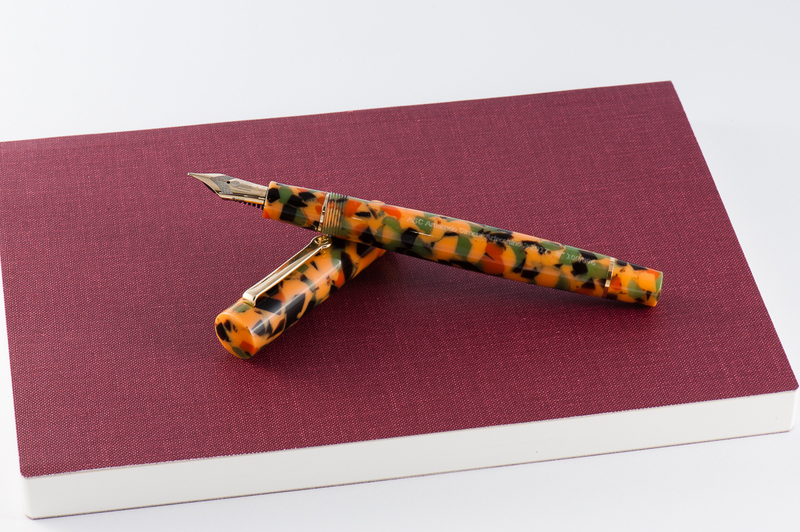 But it’s important to note that it is piston-filled for a nice ink capacity, and the Arlecchino 2 is ready to write with just one twist of the cap. And I believe my co-workers will see the colorful material and say, “What kinda pen is that?!”. 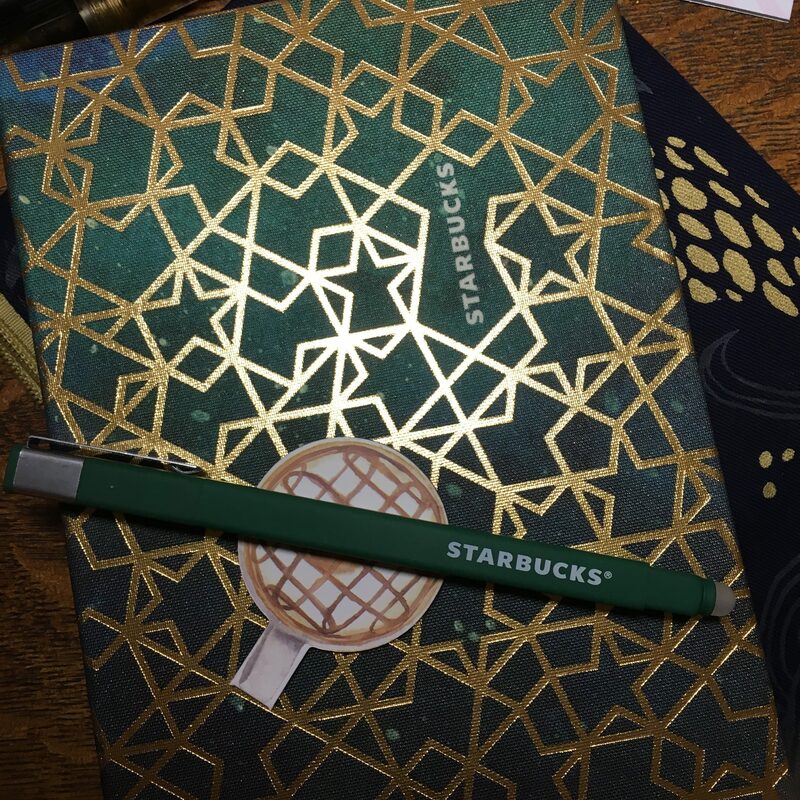 Pam: I very much appreciate the beauty of the pen and reliable writing experience. That said, I can’t recommend this pen due to the price tag. Particularly for a pen that didn’t actually leave an impression with me. 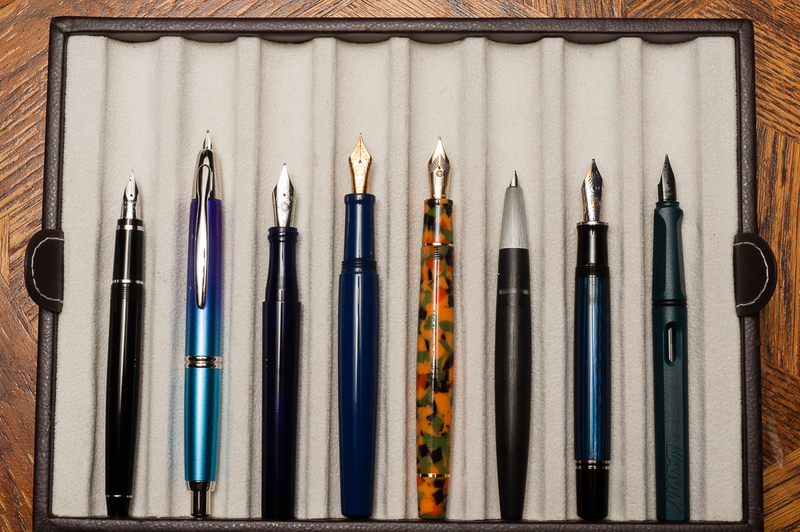 I prefer the writing experience of a Pelikan (ahem, Franz-fluence). The material is the only compelling reason to buy the pen for me. Luckily for my wallet, the material isn’t my style. 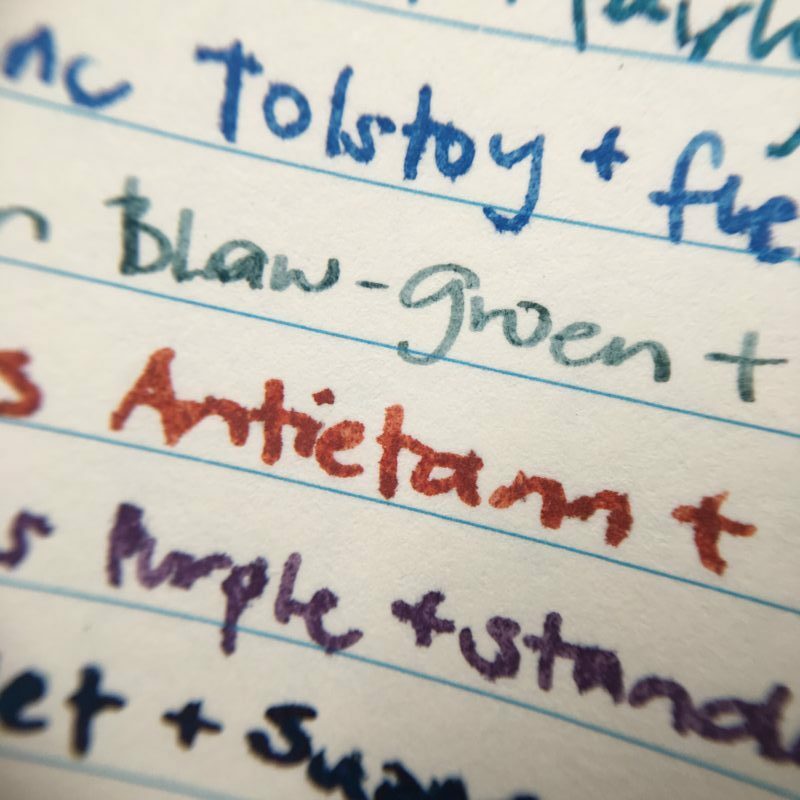 Katherine: This pen was perfectly usable — decent nib, good size, and comfortable in hand. However, it didn’t shine in any way for me. It was an okay, inoffensive pen, body material aside. 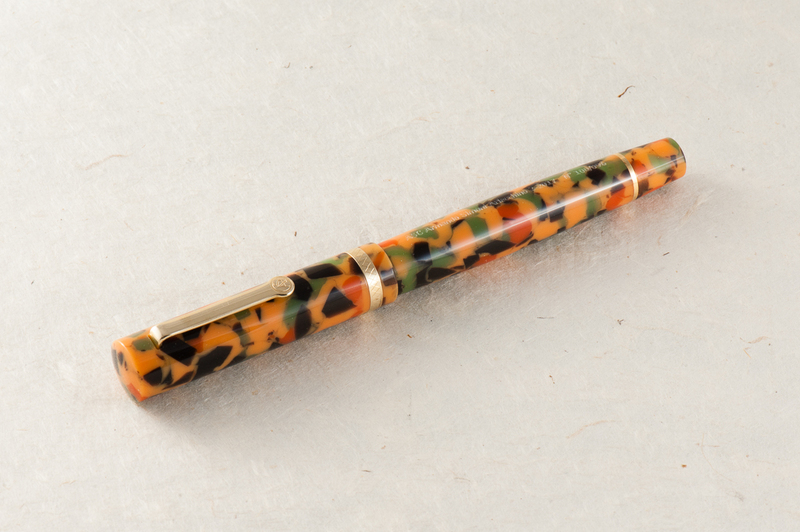 In another material, it’s a pen I wouldn’t mind owning, but isn’t high on my list of must-acquire pens. In the Arlecchino material… I’d rather have a bowl of pumpkin soup. Maybe with some chives and a pinch of paprika to round out the colors. Claire: Overall, I really like this pen. the only gripe I have with this pen is that the inside of the cap was not polished. For a pen at this price range, it seems a little bit sloppy to me. 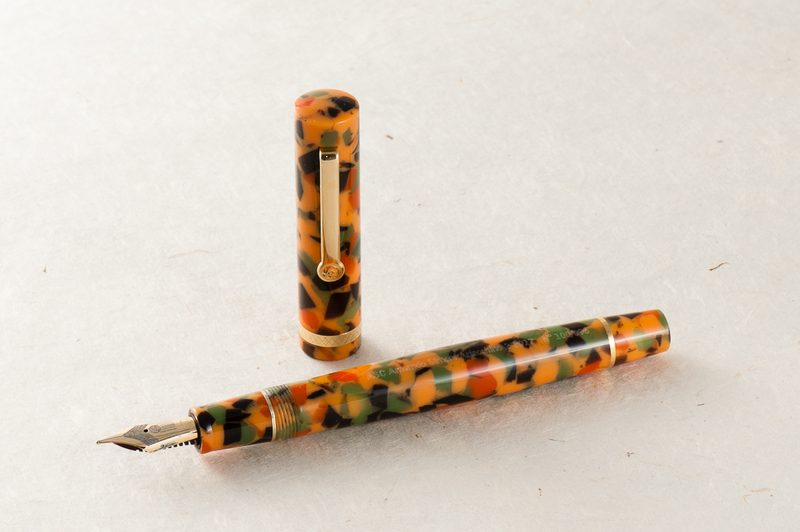 Other than this pen is lovely, though I wouldn’t feel comfortable paying MSRP on this pen. This brand has access to some of the hottest materials, and they are charging for those materials. Franz: I love this pen! 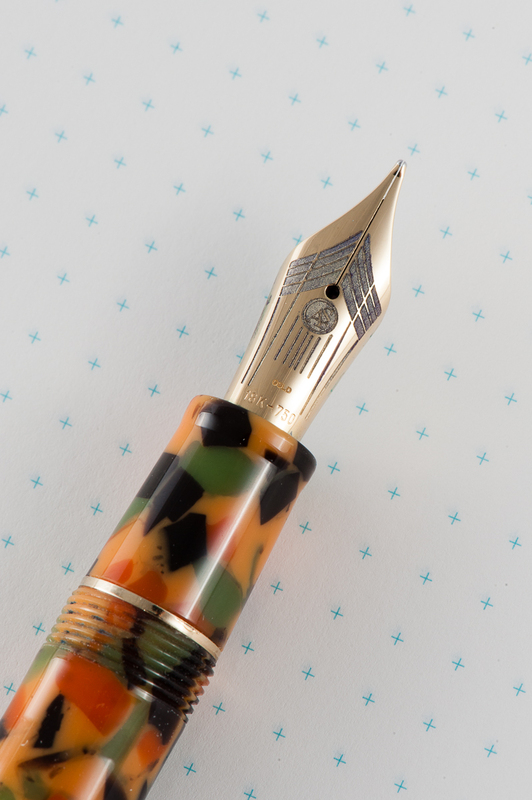 I love its shape, its material finish, its springy nib, and the history that it represents. However, I just can’t love its price tag. Yes. 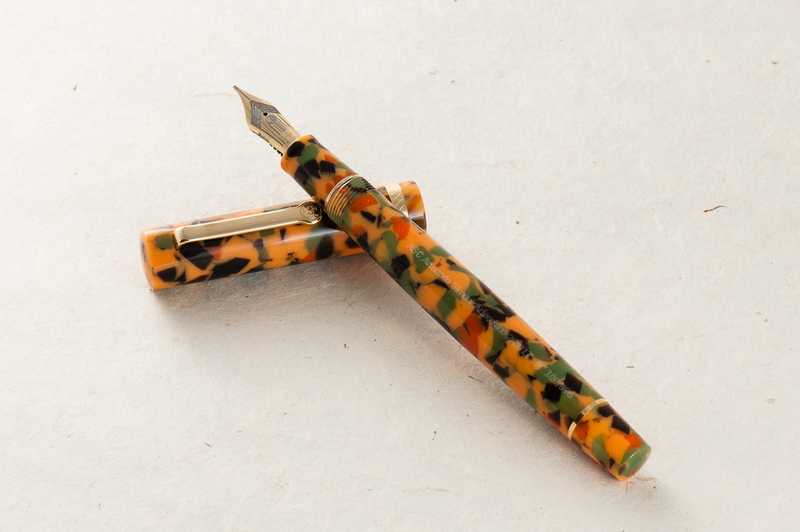 I know that it’s a limited edition of 100 pens, it’s celluloid, it’s a “flexy” nib, etc. Believe me, I understand why it costs the way it costs and also please know the fact that I “want” it. 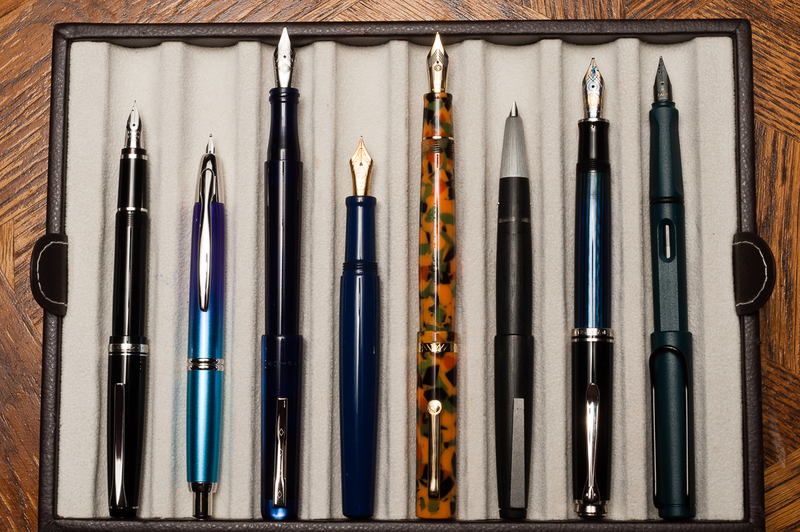 But my heart and mind says, “Hold on, not yet.” Perhaps it’s because I have a few other pens that I also want that has a lower price tag? I know that someday I’ll own the Arlecchino 2, but not yet. If you want this LE pen and have no qualms about the price, grab it while it’s available. 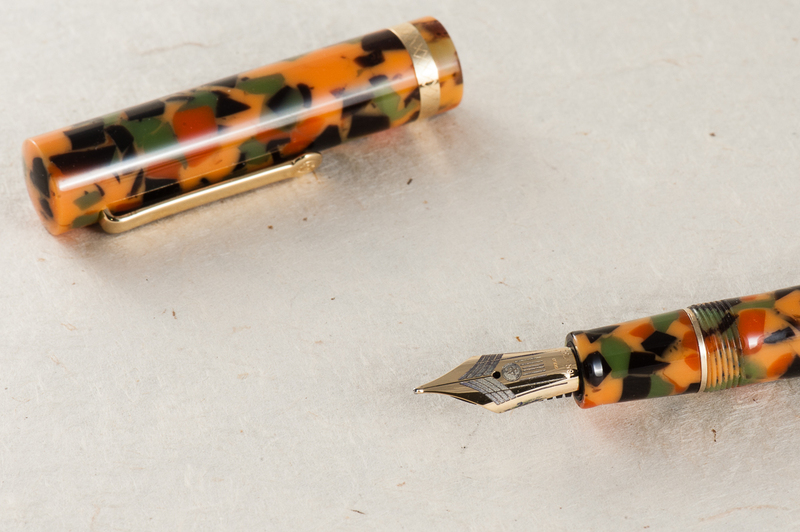 Reach out to Detlef of Bittner Pens. 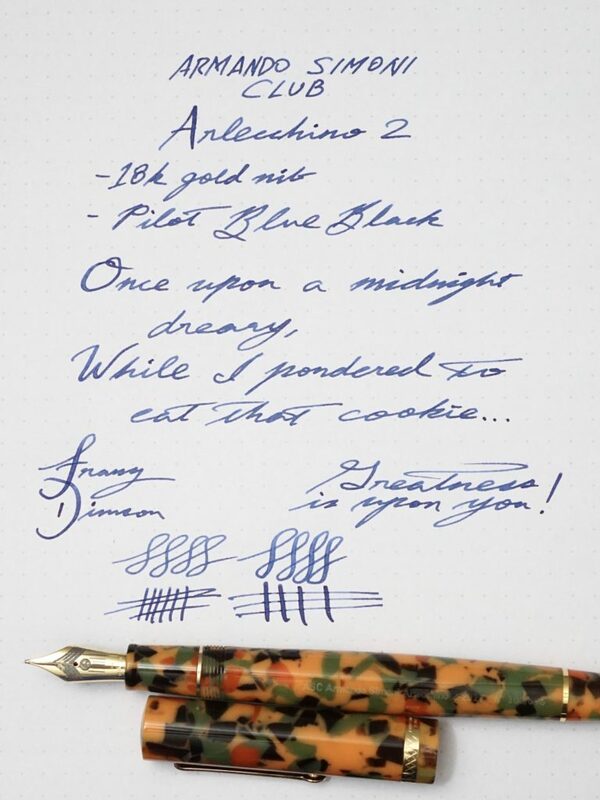 Thank you for letting us review the Arlecchino 2 Detlef! Many of you followed Katherine on her adventures through Japan, including many store exclusive inks. 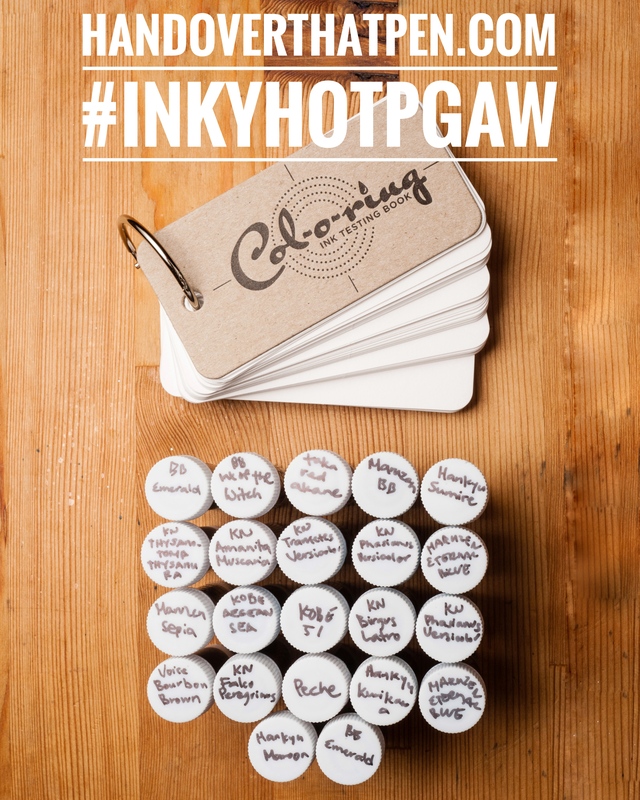 In the meantime, The Well Appointed Desk‘s Col-O-Ring ink testing book debuted! 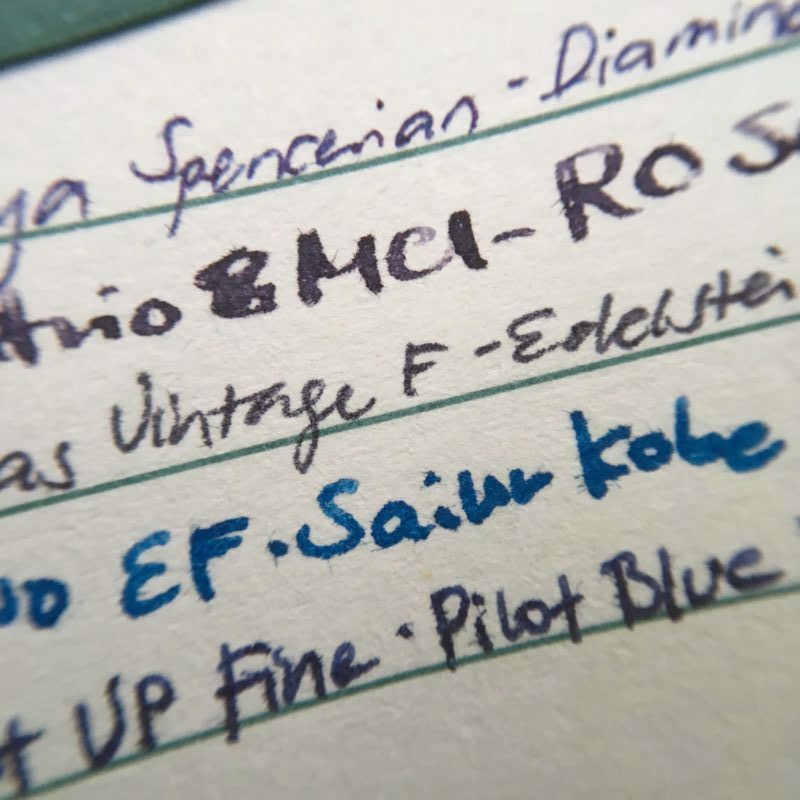 So we’re giving away a great bundle to try out and test some less common Sailor inks — 21 (We have BB Emerald in the picture twice, sorry) 4ml samples of uncommon Sailor inks + 1 Col-O-Ring ink testing book! The giveaway is open from now, 05/07/2017 until 05/15/2017 11:59pm Pacific time. One entry per person please. 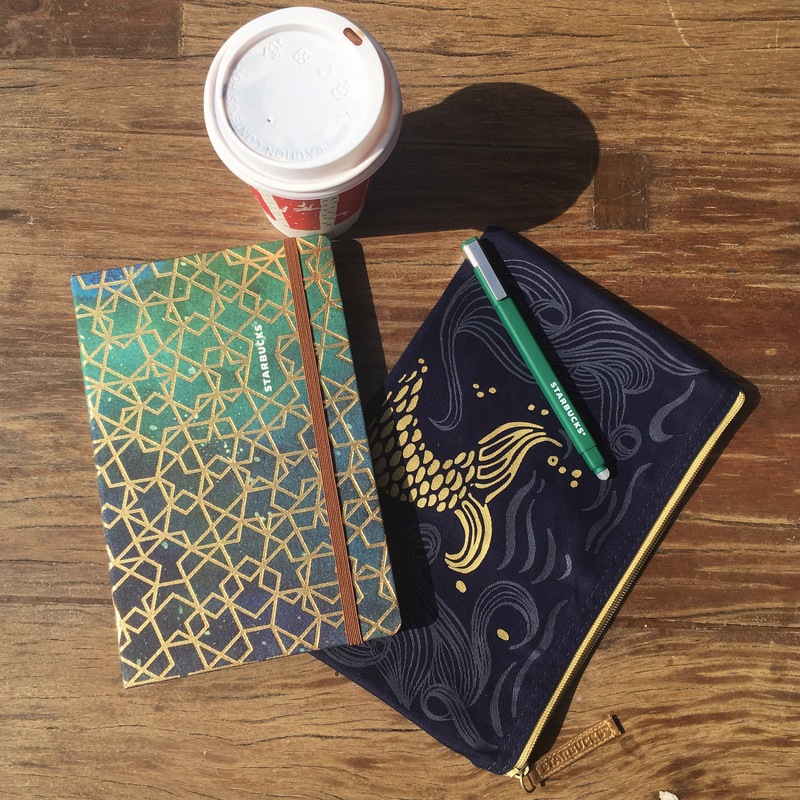 Every year, in a handful of countries, Starbucks releases a planner. This is a review of one of the 2017 designs for the Philippines. 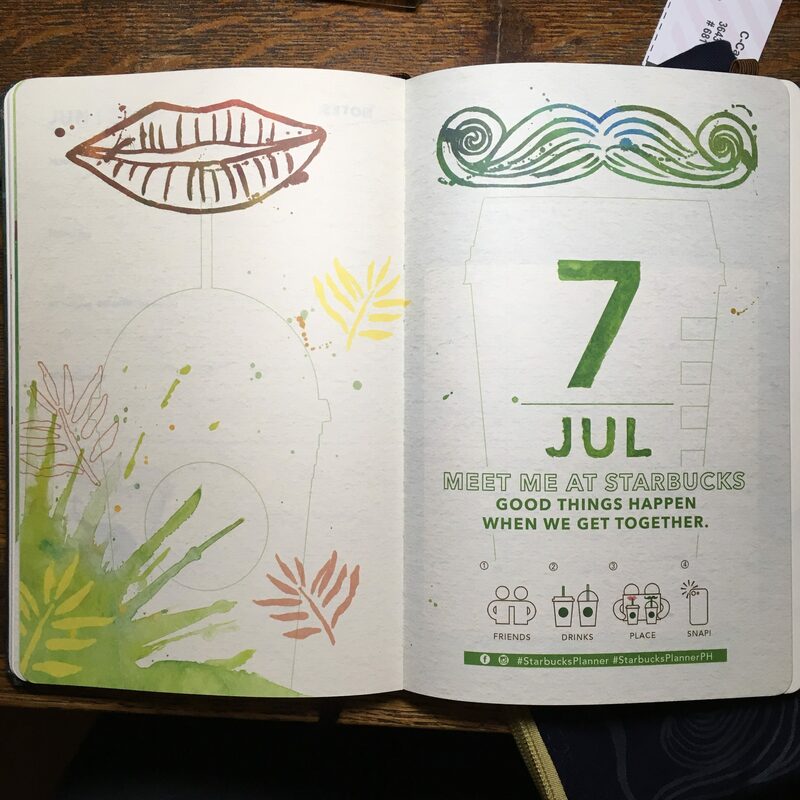 The planner can’t be purchased, and can only be redeemed by buying 18 drinks — or eBay, but prices there seem pretty crazy. 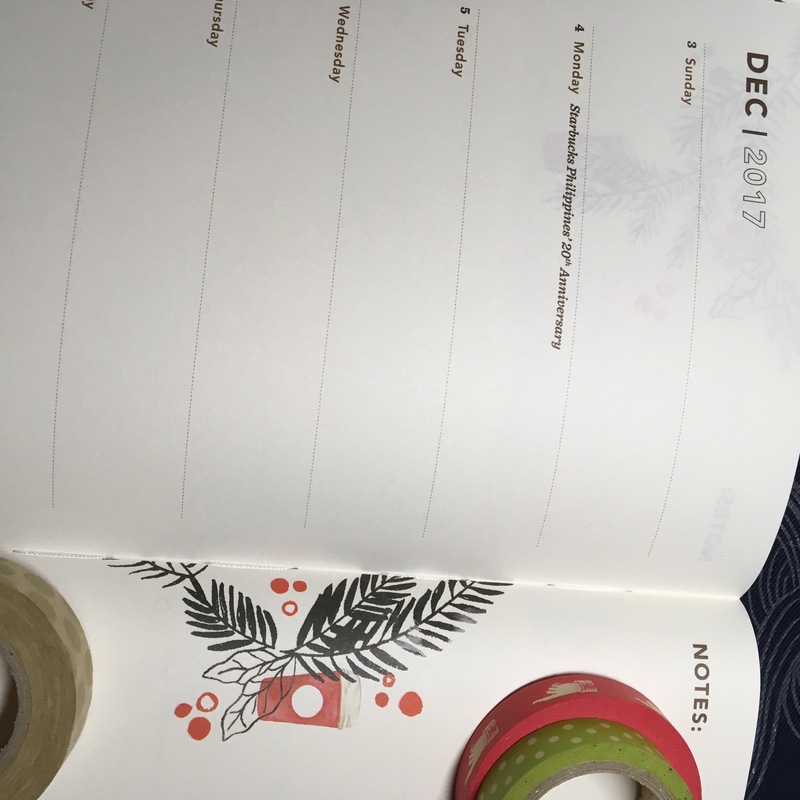 When you redeem the planner, everything is in a sealed box — a pouch, an erasable pen, the planner itself, a magnetic bookmark & a sheet of stickers. 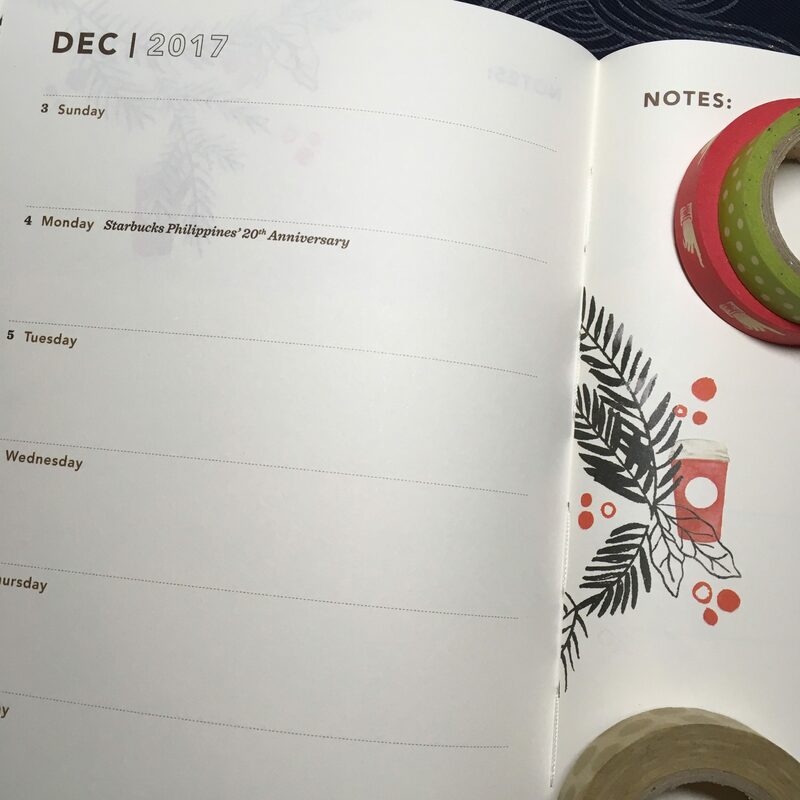 Additionally the planner has two pages of coupons in the back, but they can only be used in the Philippines. 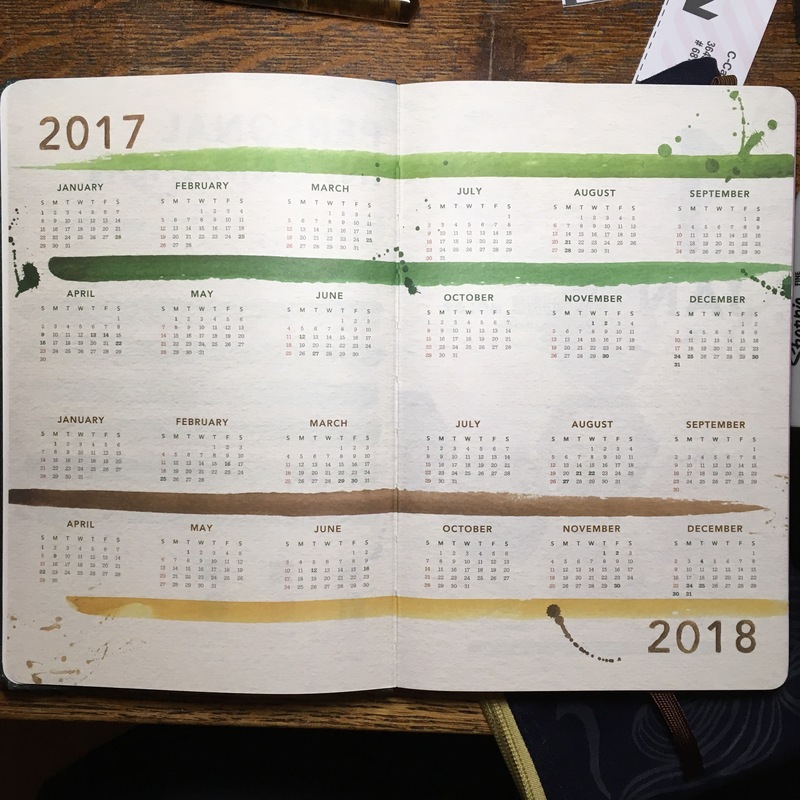 The planner starts with a year overview. 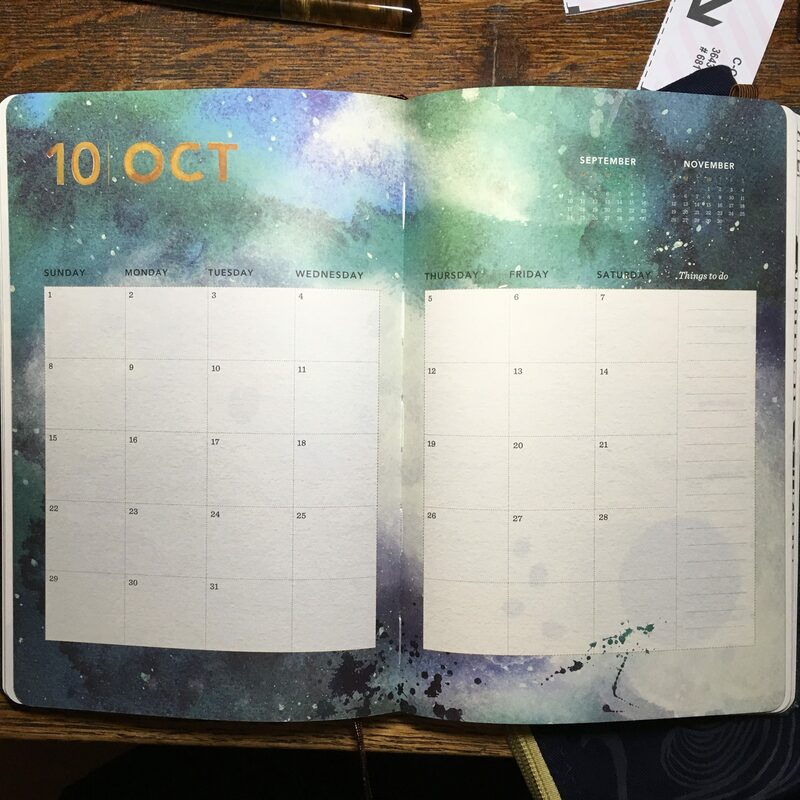 Then there’s a cover page for each month — each with different art. All in this watercolor style — some have goals to write in or space to stick pictures, and some are just art. 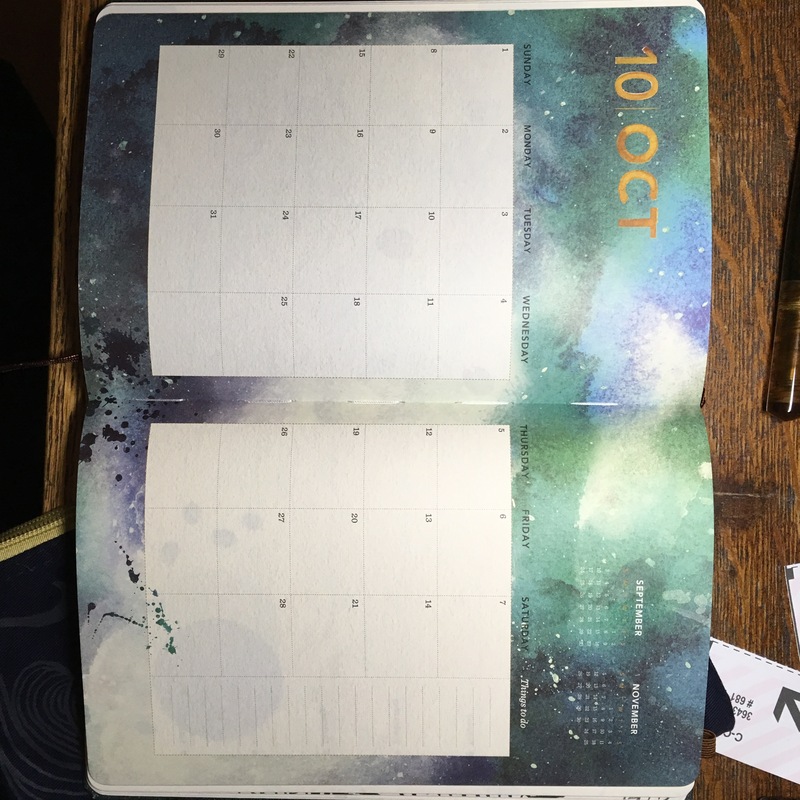 Then a monthly calendar spread. 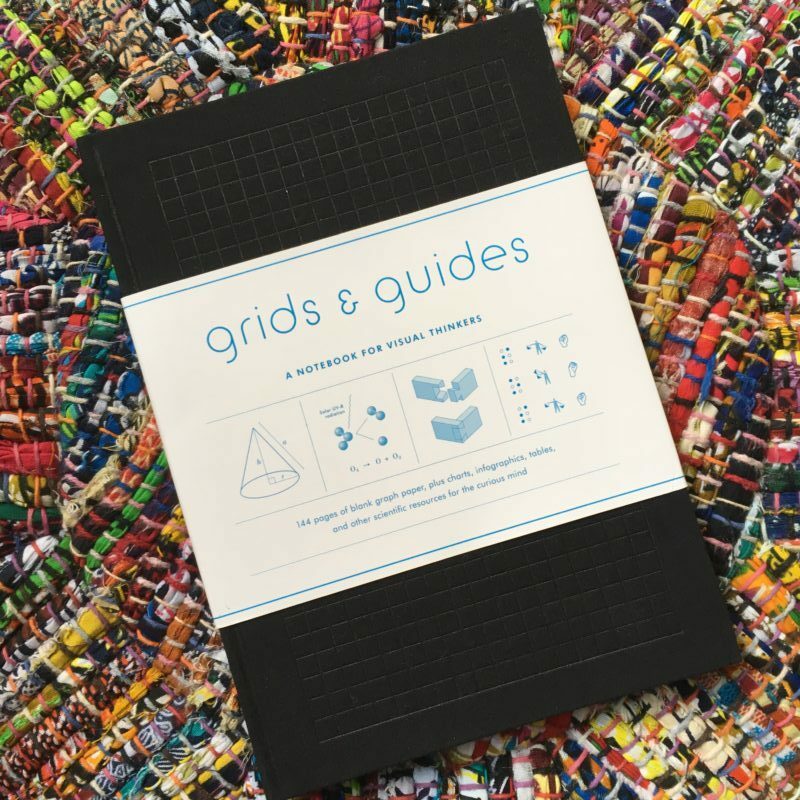 The cover of this design is foiled. And there’s the magnetic bookmark — supposed to look like the top of a coffee cup, I guess? This picture was taken in bright lighting, meant to caption the foil. I tested some pens — overall, the paper is pretty good. You can see there’s a little bit of feathering with the wetter pens (Pelikan BB, MT Swan) but overall it’s usable with most pens. 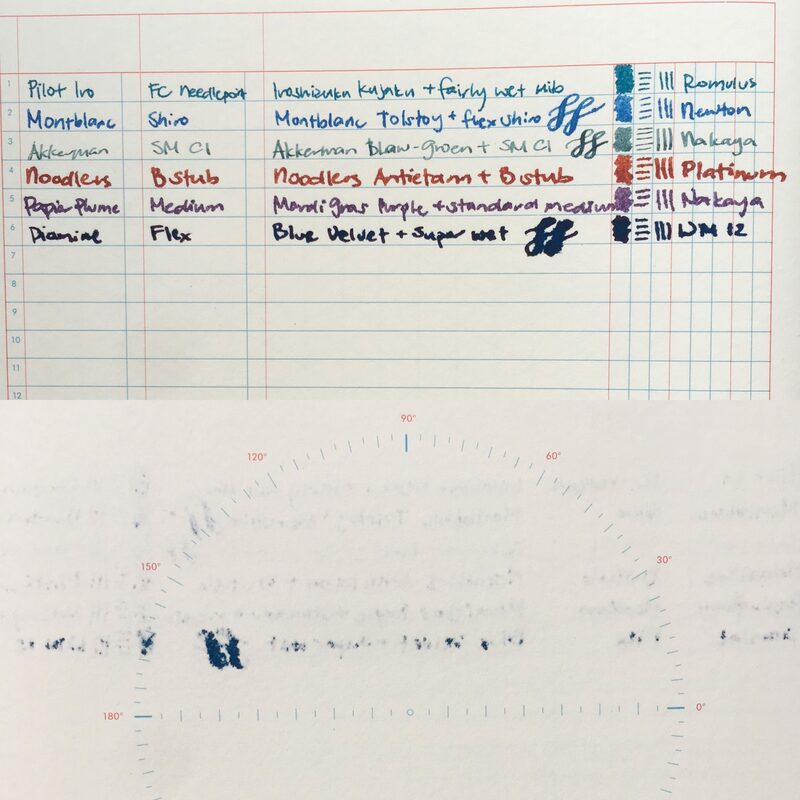 The paper allows for shading, but I haven’t seen any sheen on it at all — even with heavily sheening inks like Akkerman Shocking Blue and Diamine Lapis. Here’s the opposite side — basically no show-through. I initially thought the planner might be made by Moleskin, but upon comparing closer with another Moleskin notebook I own, the paper doesn’t look the same. And this paper holds up to ink better — though not quite as good as the Tomoe River I’ve become used to. I’m really excited to use this planner going into the New Year. I really like the layout of having an area for each day then a section for notes for that week. That’s the same layout I used to use in my Midori Traveler’s Notebook. 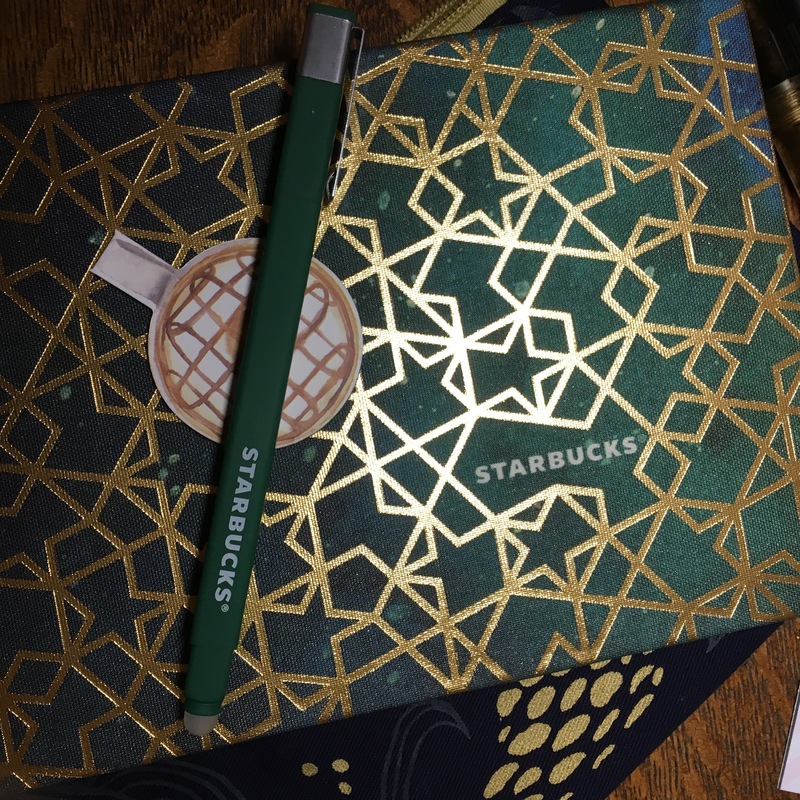 Anyone else using a Starbucks planner?